Add a groovy Scooby-Doo character to your keys or bag! Collect your favorites, and watch for the cool chase characters! Display case contains 20 randomly selected, blind-packaged key chains. These key chains featuring the characters of the Scooby-Doo cartoon will look pretty groovy on your keys, bag, or backpack. Hunt and collect your favorites, and be sure to keep a lookout for the cool chase characters! Each vinyl key chain measures approximately 3-inches tall x 2-inches wide. Ages 14 and up. 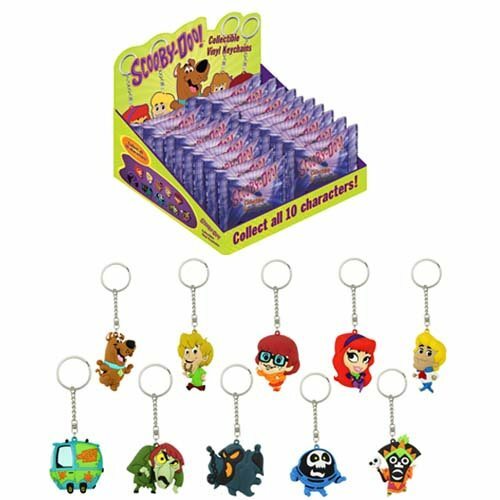 This Scooby-Doo Vinyl Key Chain Display Case contains 20 randomly selected, blind-packaged key chains. Let Scooby-Doo Keep Track of Your Keys – No Scooby Snax Required!